TACLOBAN CITY-Damage to agriculture in the region after it was pummeled by tropical storm ‘Urduja’ has reached more than P1.44 billion, affecting more than 44,500 farmers. 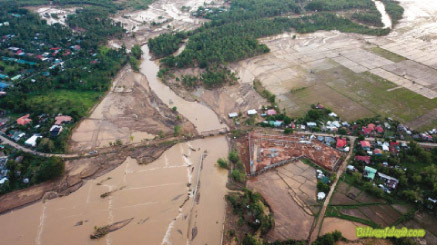 Reports from the regional office of the Department of Agriculture (DA) said that out of its six provinces, it’s the province of Samar that reported that biggest damage to its agriculture in the amount of P421.37 million. Biliran, meantime, the hard-hit town in the region due to Urduja in terms of loss of lives (52), reported damage to its agriculture at P242.49 million. Leyte posted damage to its agriculture at P397.55 million; Eastern Samar, P348.69 million; Northern Samar, P27.63 million and Southern Leyte, P5.49 million. Urduja, which struck the region on December 16, affected 44,594 farmers with Leyte posting the highest number of affected farmers at 21,065. Eastern Samar has 7,892 farmers affected; Biliran, 7,520; Samar, 5,580; Northern Samar, 2,403; and Southern Leyte, 135 farmers. About 42,287.18 hectares of rice fields in the region were hit by the massive flooding spawned by Urduja. Francis Rosaroso, DA regional information officer, said that as part of their assistance to the affected farmers, they are to distribute 6,000 bags of certified seeds to the affected farmers, particularly in Biliran. “We are also waiting for the release of about 15,000 bags loan to the region by our counterparts from Region 3,” Rosaroso said. He added that they are still confident that despite of the losses the agriculture sector sustained due to the storm, DA-8 remains confident of achieving its goal of 1.05 metric tons of palay production for the year. Last year, more than 964.8 million metric tons of palay were produced by farmers in the region.